Is pork "the other white meat," as the marketing slogan of the National Pork Board would have it? Not according to Walter Jeffries of West Topsham. Jeffries, who keeps free-range hogs on his Sugar Mountain Farm, points out that pasture-raised pork isn't white — it's red. 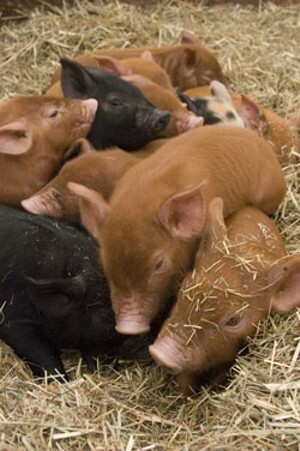 Pigs that can exercise pump more blood into their muscle, making its color ruddier than that of pigs under lockdown. Sure, it might be nice to know you're serving an athletic, red-blooded local oinker as your Easter ham. But what about taste? Is the meat of a pig born and slaughtered in-state any different from that of hogs shipped from afar? You bet, says Jeffries. The pork he produces is far more flavorful than what's generally found in supermarkets, he contends. Furthermore, his farm is one of the few sources of genuine Vermont hams. Pork sold by such iconic Vermont brands as Dakin Farm, Harrington's and McKenzie actually comes from pigs raised in Pennsylvania, the Midwest or the southeastern United States. Even Barre-based Vermont Smoke & Cure, known for its affiliation with the localvore Farmers' Diner, gets almost all of its pork from Canada. The big purveyors claim they can't come close to supplying their customers' demand with ham from Vermont farms. "There's virtually no hog production in the state, though there is a little bit of hobby farming," says R.B. Klinkenberg, chief operating officer of Harrington's of Vermont, which sells thousands of hams by mail order and at its retail stores in Shelburne and Manchester. Jeffries bristles at being classified as a hobby farmer, since pig farming accounts for almost all his income. He does agree, however, that Vermont lacks the infrastructure to sustain hog raising on a broad commercial scale. "It's a cow state," he observes, pointing out that the Vermont Agency of Agriculture pays much more attention to dairying than to other types of farming. When it comes to taste, the big issue isn't so much where pigs live as what they eat, Jeffries suggests, though type of feed is often related to location. Most Vermont-raised pigs forage outdoors on pasture, while those imported to Vermont from other states have usually been confined in pens where they were fattened with a mixture of corn and soybeans. "You are what you eat," Jeffries points out. If that's true, his 200 free-range pigs embody some signature Vermont products. In addition to hay, they get whey from Vermont Butter & Cheese in Websterville and occasionally cheese trim from Cabot and boiled barley from Stonecutter Brewery in Barre. "If a pig was raised in a pen and ate corn, it'll taste one way," Jeffries says. "If it was raised on pasture and ate grass and whey, it'll taste another — better, sweeter — way." Breeds also affect taste, says Christa Alexander, co-owner of Jericho Settlers' Farm. The Tamworth and Berkshire breeds she helps raise on a 200-acre leased spread in Jericho are "known for the flavor of their meat," Alexander notes. Those heritage breeds "don't do well in confinement," she adds, because they're more susceptible to disease in those conditions than are the standard breeds chosen for their performance in intensive pig-farming settings. Alexander knows something about such matters, even though she's been farming along with her mother, Emilie Alexander, and her husband, Mark Fasching, only since 2002. She studied biology and environmental science at Williams College in Massachusetts and became a farmer because she "wanted to produce food that's good for me, my family and the land," she says. "I got fed up with the quality of the food coming from the corporate agriculture system." Beth Whiting raises a Tamworth-Berkshire cross breed on Maple Wind Farm in Huntington. It makes for a "very flavorful" ham, she says. There's no need to glaze it with honey or maple, she adds, because the meat speaks for itself. Whiting and her partner, Bruce Hennessey, are both former educators who have been making a living as farmers since 1999. Like other local pork producers, Whiting says she and Hennessey can't compete on the basis of price with highly concentrated pig operations that benefit from economies of scale. 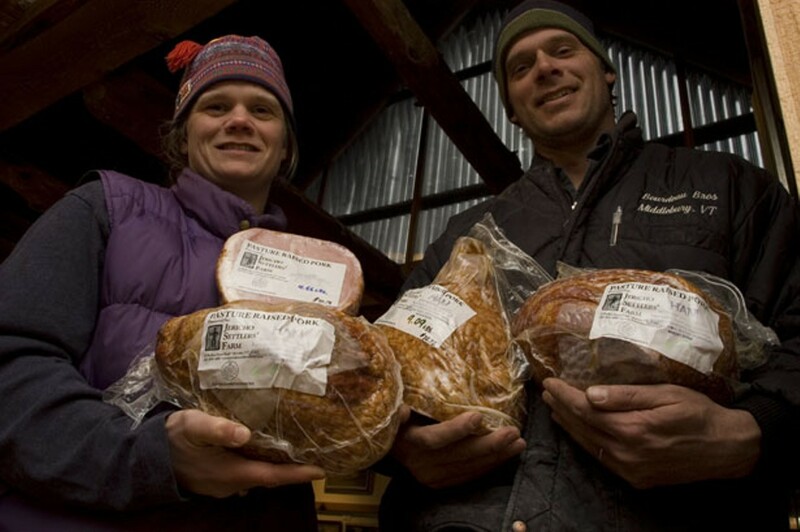 A ham from Maple Wind Farm costs $7.75 per pound, compared with the roughly $4 per pound that supermarkets charge for a McKenzie ham. Prices are similar for Jeffries' Sugar Mountain Farm and Jericho Settlers', which also incur additional expenses because of their natural farming methods. Putting the word "organic" on one's meat isn't cheap, either. Jeffries' meat would be labeled organic, he says, if he bothered to go through the U.S. Department of Agriculture certification process. Until recently, pork from Whiting's farm did carry a USDA organic certification, and she still has some organic hams available for sale. But Maple Wind Farm is about to start feeding its pigs conventionally grown grain because the price of the organic variety has risen 60 percent in the past year, Whiting says. Not all pigs raised in Vermont are free to roam on pasture land. At the Duclos & Thompson Farm in Weybridge, some 50 hogs are kept in pens and fed grain. But they're not juiced with hormones or antibiotics, notes co-owner Tom Duclos, who's been farming in Weybridge since 1982. He also raises lambs and beef cattle on 75 acres that lie at the edge of an increasingly suburbanized area two miles from Middlebury College. Like the other Vermont pig farmers, Duclos sells most of his pork to local stores and restaurants. When customers at American Flatbread in Burlington or Middlebury order a pizza with ham or bacon, they're getting a taste of the Duclos & Thompson Farm. Sugar Mountain's pork is served at the Inn at Essex and can be purchased at the Plainfield Co-op and the Hunger Mountain Co-op in Montpelier. Jericho Settlers' Farm supplies South Burlington's Healthy Living and Burlington's City Market, as well as Natural Provisions in Williston and VTGreenGrocer in Richmond. Maple Wind Farm sells pork to Mary's at the Inn at Baldwin Creek in Bristol. And consumers can purchase hams and other pork cuts from each of these farms by calling in advance. But they don't have the name recognition of Dakin Farm, which makes hundreds of on-site ham sales at its retail outlets in Ferrisburgh and South Burlington. Dakin draws not only tourists but also Vermonters who "have grown up on our hams," says company president Sam Cutting IV. His family-owned business does have deep roots in the state, dating to 1792. Cutting's father began smoking pigs 50 years ago over wooden barrels filled with corn cob. He later built a smokehouse the size of an ice shanty, which in turn was supplanted by the modern smoking facilities inside Dakin Farm's Ferrisburgh store. The smoking process is key to creating the taste of pork, Cutting says, noting that Dakin still uses corn cob to produce meat that's "distinctive and delicious." 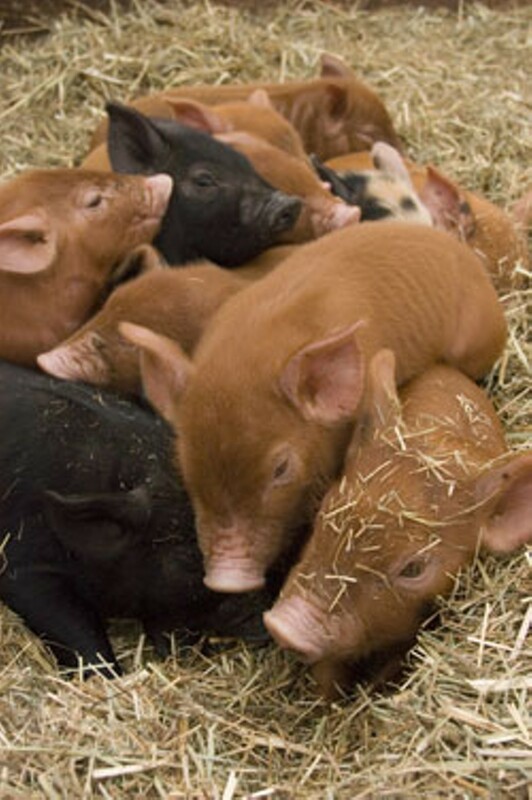 Though they're not Green Mountain oinkers, most of the pigs the company sells come from "relatively small-scale farms" in Pennsylvania's Amish country, Cutting says. Another local pork giant is McKenzie, which still bills itself as "Vermont's Original Purveyor of Specialty Meats." Founded in Shelburne in 1909, today it operates a distribution center on Flynn Avenue in Burlington. The business' first smokehouse was located on George Street in the Old North End, notes Greg Rouille, general manager of what's now known as McKenzie Country Classics, a division of Massachusetts-based Kayem Foods, Inc. While he acknowledges that "there's a large difference between grain-fed and grass-fed" pork, Rouille also regards smoking as decisive in generating the meat's taste. McKenzie Country Classics still follows a traditional curing and brining recipe, he adds. Harrington's of Vermont, established in 1873, probably sells more hams than any other purveyor in the state, says Klinkenberg, the company's chief operating officer. He declines to give a specific figure, however. "Taste is a subjective matter," Klinkenberg does say, echoing Cutting and Rouille in suggesting that curing and smoking are crucial to the outcome. Harrington's smokes its pork in Richmond, while McKenzie's products gain their distinctive flavor at Kayem-owned facilities in Massachusetts. Vermont farmers who raise their own pigs generally rely on local smokehouses — though Whiting, of Maple Wind Farm, says some of her customers prefer their ham uncured and unsmoked because of health concerns about nitrites. However it's prepared, though, Vermont pig is growing in popularity. And rising grain prices, which drive up the costs of factory farming out West, could be good news for the local industry. Some day soon, Vermont's cows may have company.